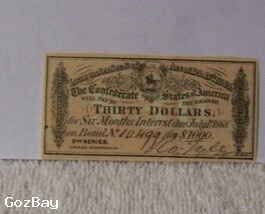 Authentic Confederate $1000 bond $30 coupon. Loan under Sec. 6 of Act of Feb. 17th, 1864. It is a 2nd series. Hand numbered 10499. Condition is it has 1 pin hole and a fold from when it was atached to the bond. No tears.